The black maize beetle (Heteronychus arator) is a pest to many of the pasture grasses planted on Eastern Cape dairy farms. Two of the most prominent grasses which are favoured by these beetles are ryegrass and kikuyu. Black beetles also attack cereal crops such as maize, triticale, sorghum, wheat and barley. Black maize beetles favour sandy soils, which are high in organic matter. They thrive at temperatures of 20-25°C, and stop feeding at soil temperatures below 15°C. Higher than usual spring and summer temperatures therefore result in a higher than normal survival rate of the larvae. Larval survival is also increased by drier than normal summer conditions. Drought conditions are therefore conducive to black maize beetle infestations. Successive droughts especially lead to black maize beetle outbreaks. 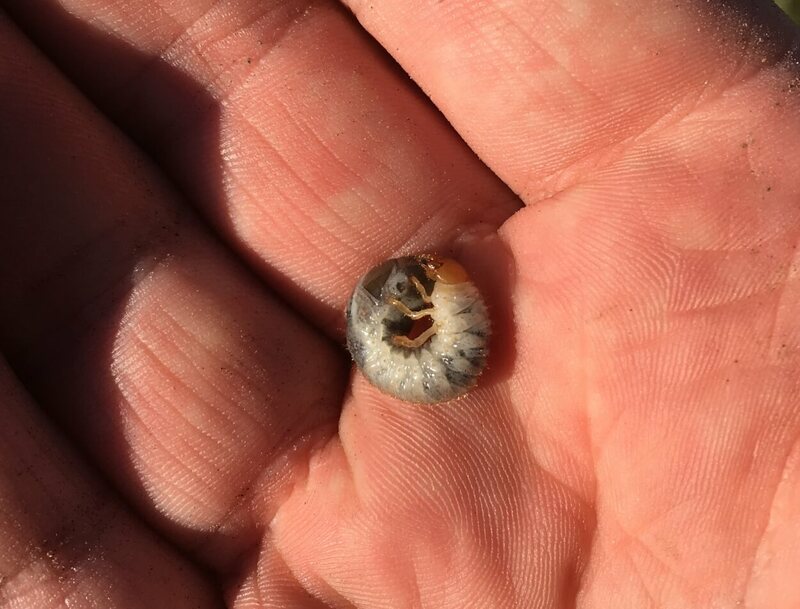 The larvae are white grubs with a brown head, have six legs and are usually curled in a C-shape (see the images below). They look very similar to many other beetle larvae, including dung beetles, and are therefore better distinguished by their activity. Most other beetles do not attack plants as larvae, so in pasture where root pruning can be observed, this is a good indication that black maize beetle larvae are present. There are two main flight peaks during the year in South Africa, late spring to early summer (October – December) and late summer to early autumn (February – April). The second is a much larger peak. These flight peaks are important in cereal crops, as the adult beetle can cause significant damage to the plants. In pastures though, the most important stage is just before these flight peaks when the larvae are at their most mature stage. 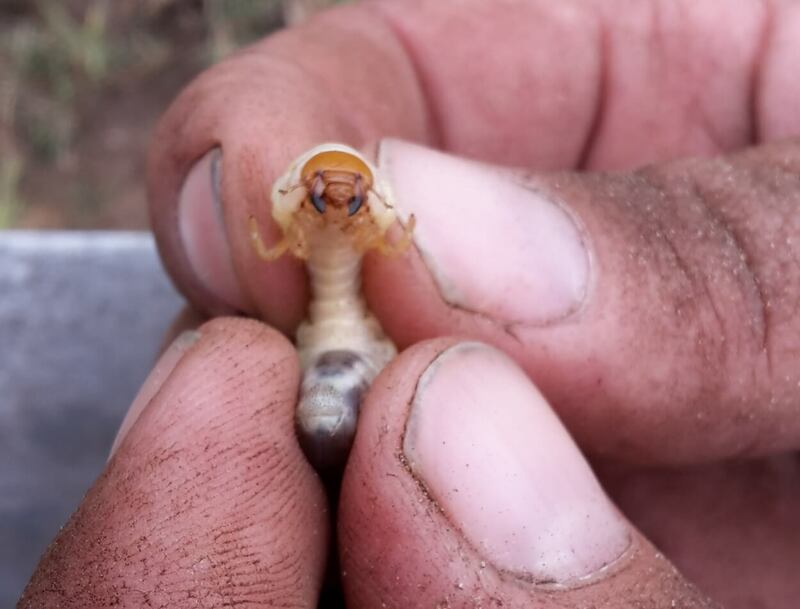 Black maize beetle larvae prune or completely severe grass roots close to the crown of the plant. 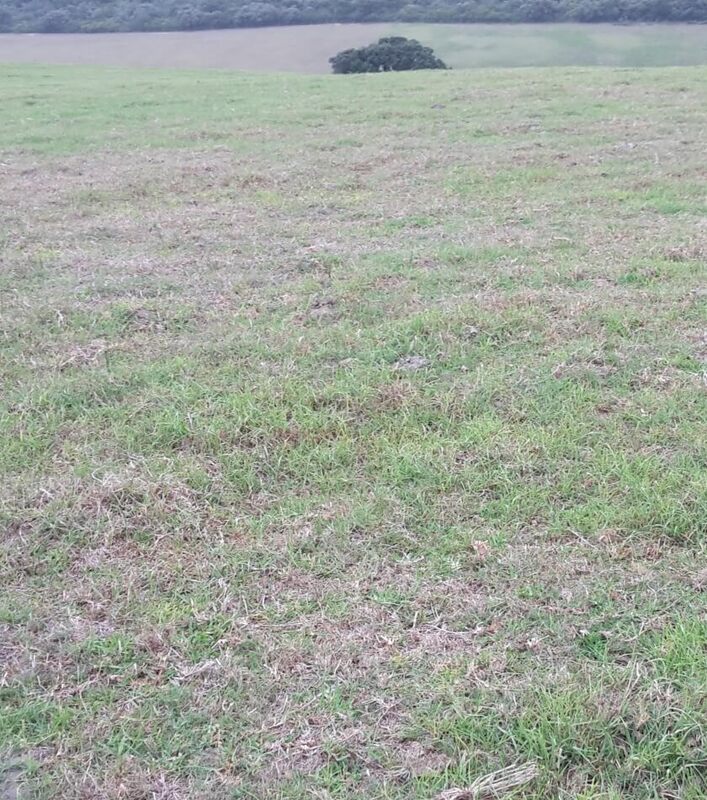 Where there are a large number of larvae these results in patchy pastures where the grass can be rolled back or pulled out due to the lack of roots (see images below). The grass pulling effect of this larval root feeding is exacerbated during drought conditions as drought-stressed grasses stop producing new roots. Add the total number of larvae found in the ten cubes, and then multiply this amount by 2.5. This will give you the larval abundance per square meter. 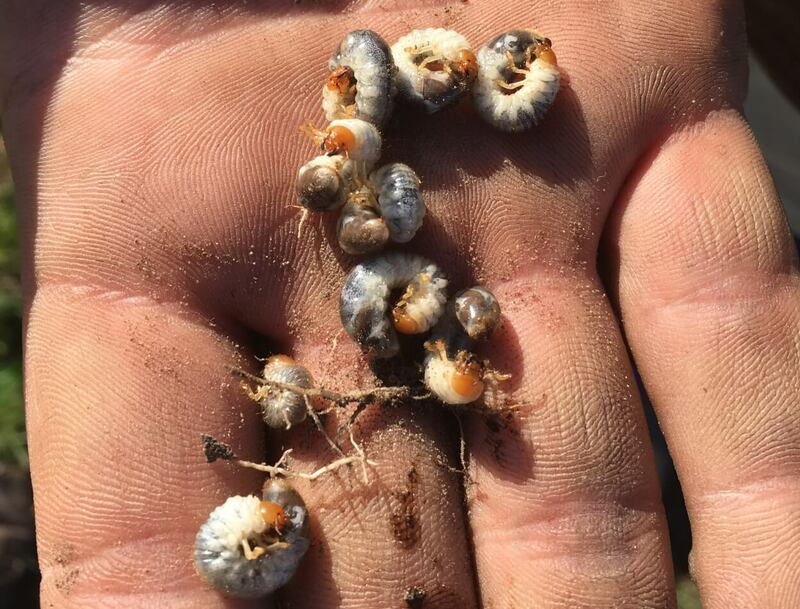 When the number of larvae exceeds 15 per square meter, they likely have already, or will cause damage to pastures. In dry years, damage will be apparent at even lower densities. Insecticide control has not been shown to be very effective in controlling black maize beetle on pastures. 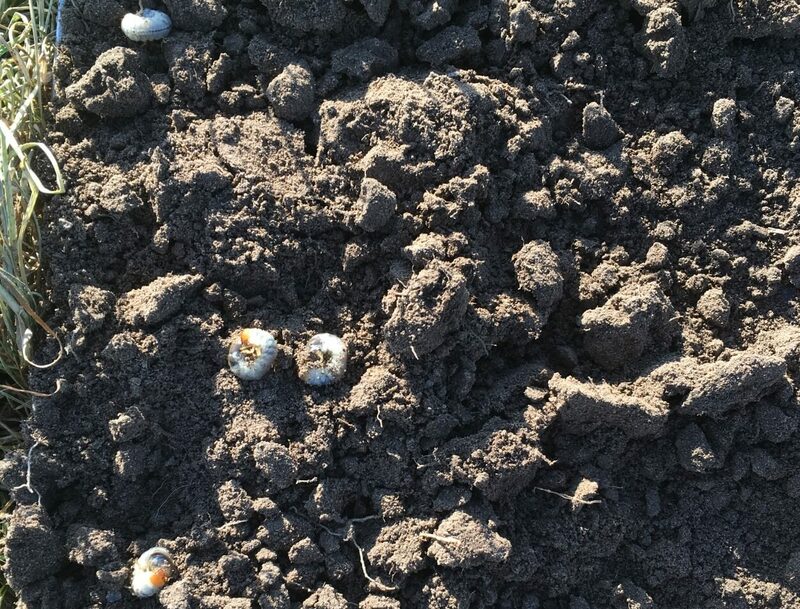 Most insecticides only kill on contact, and because the larvae are below the soil surface and the adult beetles are very active, insecticides are not effective at killing large numbers. A possible option is to treat seeds with insecticides. A huge disadvantage to using insecticides is that they indiscriminately cause harm to soil life. Even if the insecticide used is specific to scarab beetles, it could lead to the killing of beneficial beetles, such as dung beetles. 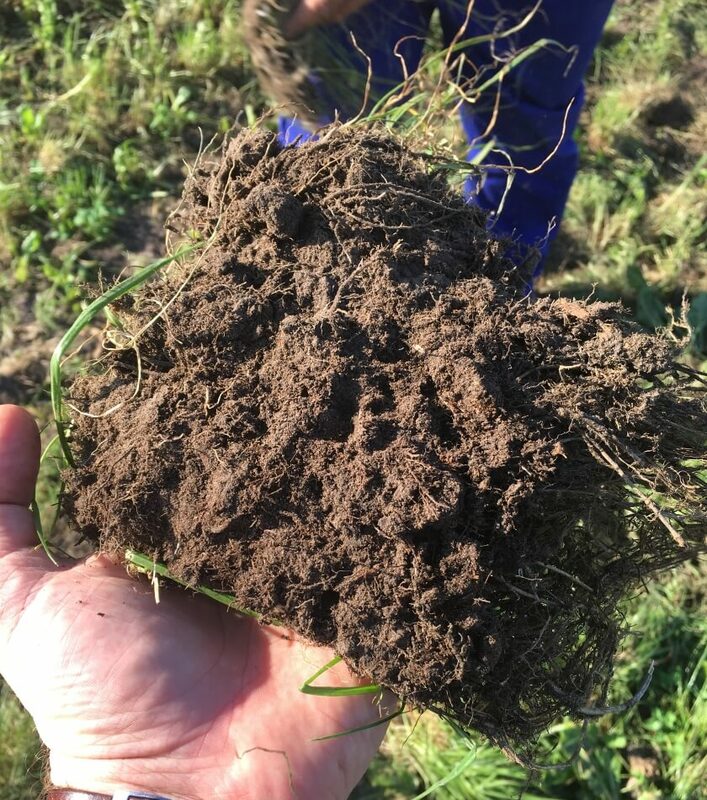 In New Zealand and Australia ryegrass cultivars with a viable endophyte (symbiotic bacteria or fungi which live in plant roots, providing protection to the roots) have been used to control black maize beetle populations. Although no current endophytes are known which deter the larvae from feeding on the roots, ryegrass with viable endophytes limit the adult beetle from feeding, and when there is no alternative feed source these adults are then not able to lay eggs. Black maize beetle do not cause any damage to legumes, chicory or brassicas, therefore the inclusion of these species in a pasture mix ensures that there are still thriving plants during a black maize beetle infestation and limits the amount of food available to the larvae. 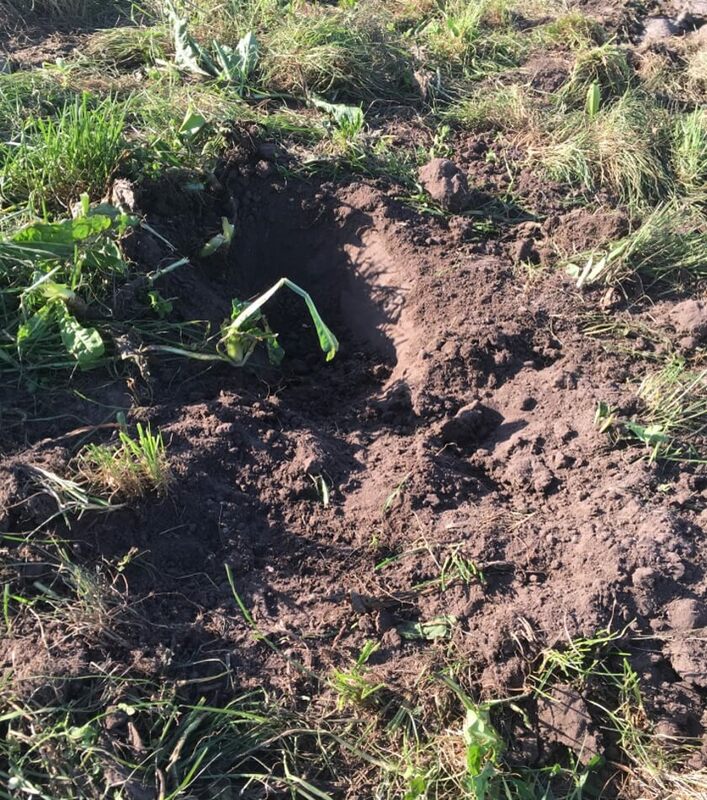 Planting as late as possible in autumn can also potentially limit damage to new plants, as the colder temperatures will limit larval activity. It is not known why, but optimal pH levels also limit black maize beetle larvae numbers. De Klerk N. 2015. Early warning system for the black maize beetle (Heteronychus arator Fabricius) in a major maize producing region of South Africa. Submitted in fulfilment of the requirements for the degree of Magister Scientiae in Entomology. Department of Zoology and Entomology, Faculty of Natural and Agricultural Sciences, University of the Free State, Bloemfontein, South Africa.